The hardware store down the street and around the corner, not “local” per se, but as close to local as it gets for a hardware store in this day and age, the one we went to five times the first day we lived in the neighborhood, just closed for good. Last Friday was its last official day of business; when I heard the news of its impending demise I couldn’t help it — I felt like I’d just learned someone died. When I walked into the store on Friday — the desperate owner, needing to liquidate the stock, slashed prices by 50% and sent out a plea for final business — I felt complicit in something grave and terrible. But — why mourn? What was the building but bricks and mortar? What on earth was sold there that can’t be found at the bigger, possibly “better” home improvement mega-store two miles further up the road, where prices will always cheaper and the shelves are never empty? 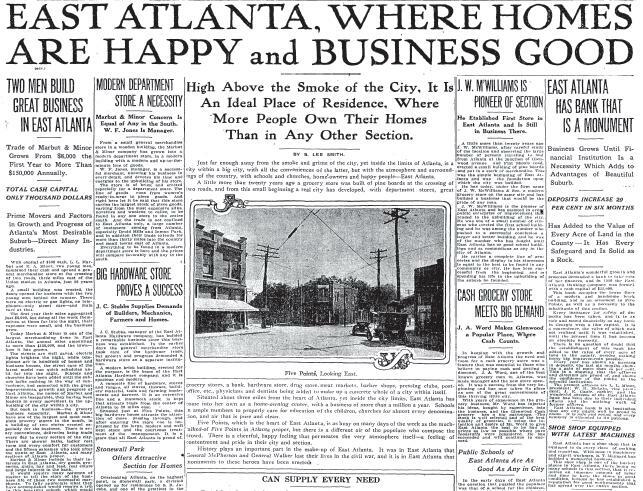 Once, most of the neighborhoods in intown Atlanta had their own commercial strips — one-story storefronts roofed with curly terra-cotta tiling that housed banks, grocery stores, dry cleaners, dentists, doctors, branches of the library and the post office. They were cities within the city, they made the larger fabric of it more manageable, and when you walked through the doors of such establishments — within walking distance of one’s home — I imagine that in some respects at least, you felt known. In old photographs, the curved hoods of the cars nosed into the parking spaces out front of the buildings were as confident and blunt as bombs, and a figure is usually walking into or out of the frame. Now, of course, we’re enamored with speed, and convenience, and quantity, and we shop elsewhere. Rest in Peace, East Atlanta Hardware.